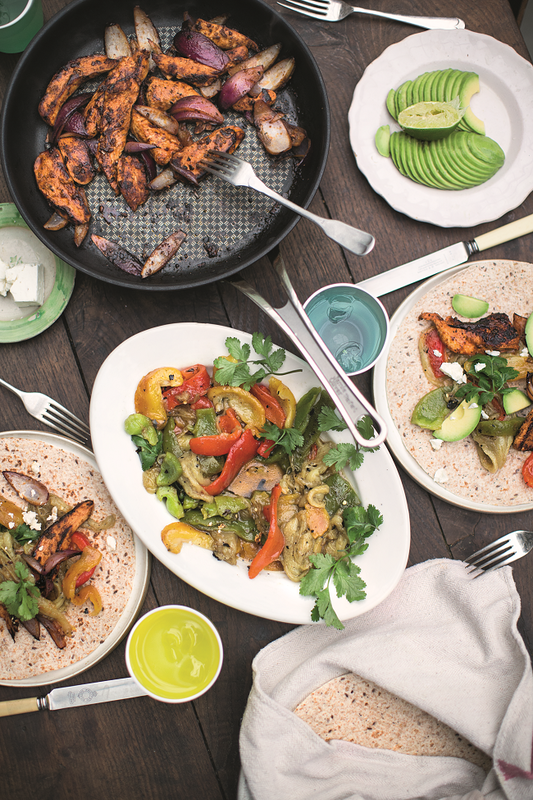 Sticking to super-lean chicken breasts is the key to making super-food fajitas, and also provides us with a great source of protein, ensuring our muscles stay strong and healthy. Put 1 tablespoon of oil into a bowl with the vinegar, chilli sauce, oregano, paprika and a pinch of sea salt and black pepper. Crush in the unpeeled garlic through a garlic crusher and mix together. Peel and halve the onion, slice into 1cm-thick wedges, then slice the chicken lengthways 1cm thick and toss both in the marinade. Leave in the fridge for at least 1 hour, or preferably overnight. Blacken the whole peppers and aubergine over a direct flame on the hob, or in a griddle pan on a high heat, until charred and blistered all over. Pop the peppers into a bowl and cover with clingfilm for 10 minutes, then scrape off most of the black skin, discarding the stalks and seeds. Pinch the skin off the aubergine and trim off the ends. Nicely slice it all 2cm thick, dress on a platter with the juice of 1 lime and a few picked coriander leaves, then taste and season to perfection. Cook the chicken and onions in all that lovely marinade in a large non-stick frying pan on a medium-high heat for 6 to 8 minutes, or until cooked through, turning halfway. Peel, destone and finely slice the avocado, and squeeze over the juice of half a lime. Warm the tortillas in a dry frying pan for 30 seconds, then keep warm in a clean tea towel. Take it all to the table, with the feta and the remaining coriander leaves, and let everyone build their own. In Super Food Family Classics, Jamie has taken a whole host of much-loved classic comfort food dishes and ultimate family favourites and cooked, rewritten, tested and edited them to guarantee they are not only super-delicious, but are also totally balanced and align with Jamie’s super-food philosophy. From Chocolate Porridge to Chicken Fajitas; Sweet Potato Fishcakes to Mac’n’cheese with extra veg, every recipe has been designed to give you and your family a brilliant boost of goodness, with at least two portions of veg and fruit in every lunch and dinner meal. With Jamie by your side, you can be confident of adding some new recipes to your family’s weekly repertoire and by making some small changes to ingredients in every day meals you can take some practical steps to make mealtimes a little healthier for you and all the family. 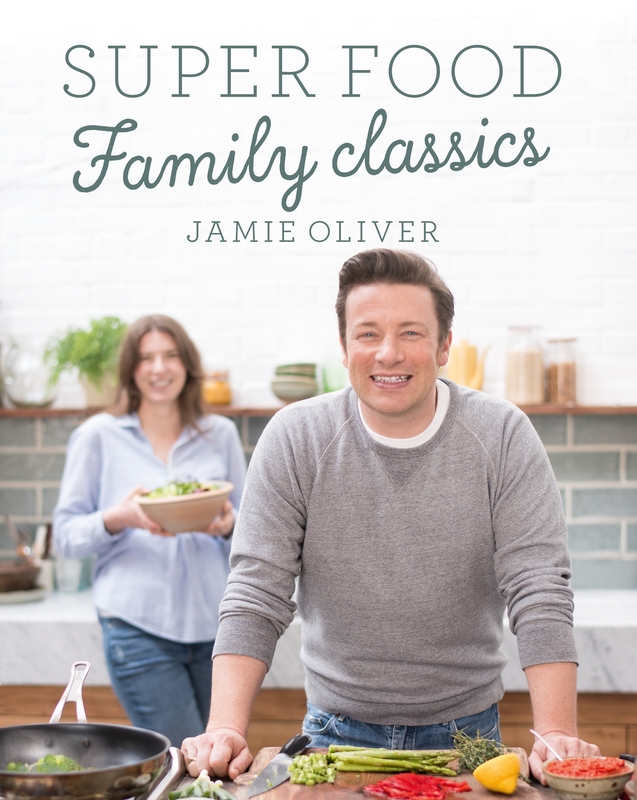 Super Food Family Classics by Jamie Oliver is published by Penguin Random House.